Based off of the screenshots (and the trailer, which is awkwardly captured via camera), I was beyond ecstatic to boot it up and find that The Undead Syndrome (240 MSP) is utterly made from the stuff I’m interested in. 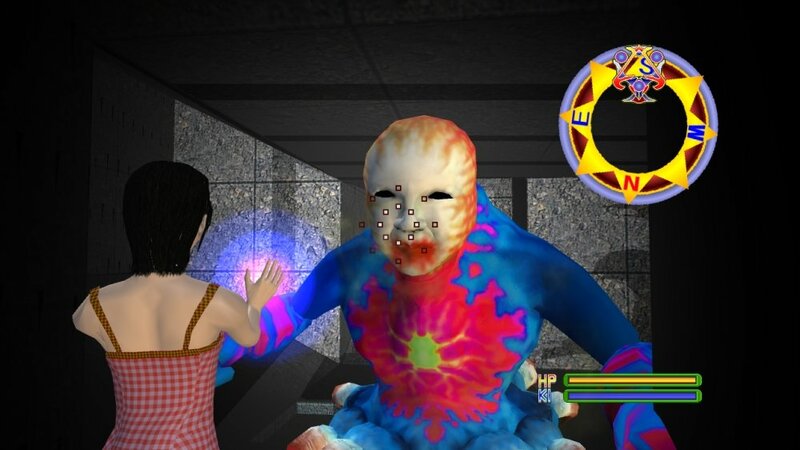 The list of games it takes parts and its tone from include: Killer7, Parasite Eve, Silent Hill, Deadly Premonition, and Kenji Eno’s ‘D’ series, among other ‘bizarre horror’ titles past and present. Given that pedigree, it’s shouldn’t be a shock to hear it’s also undeniably Japanese. The only other title I’ve played from developer MukagoSoftware Development was last year’s terrible and terribly-flawed Bioerosion. TUS is fortunately a much more polished effort, both in design and scope. The game starts with a nameless woman, stabbed in broad daylight walking down a deserted street. Without explanation (or dying, apparently), she’s transported to a ‘nightmare’ world in the form of a haunted house, where she’ll attempt to learn the truth of what’s going on and catch her murderer. While this is the stated main goal, it also involves killing off three multi-colored and tentacled monstrosities, checklist-style, and fighting dozens of clones of her killer, and weird, alien-like fish, scorpions, and jellies. Yeah, I know, sounds like one hell of a head trip. Graphically, the game is gorgeous for XBLIG, with plenty of clean (and overused) textures and shadow / lighting effects. The third dimension makes for some awry camera angles in tight spots, but goes comfortably ‘over the shoulder’ for fighting. And that combat takes an interesting form with KI, which allows our protagonist to launch bursts of energy from her hands. In addition to leveling up RPG-style, your KI is upgradeable via ‘implants’, crystals that give boosts to stats or, with experimentation, enable new ways to fight and explore the environment. Exploration plays a big role, of course, and is intriguing, if a little vague. You’ll find various colored keys to open locked doors, most of which aren’t marked, naturally, and there’s some light puzzles to solve (check surrounding walls for hints). Forgettable platforming bits are kept to a minimum. The rather impressive audio and cues alert you to enemies (a la Silent Hill), and keep the unease dialed up at all times. In between the heavier action or odd story snippet, you can catch your breath and recharge in the scattered save rooms, or buy items and crystals in the shops, manned by a spectral salesman. There are definite downsides. It desperately needs some kind of mapping system and a much larger inventory (you’re constantly running out of space). Some of your shots miss when they should hit, and cramped rooms and corridors mean enemies can effectively pin you in a corner without a way to hit back, enemies that love to inflict status ailments. Did I mention the enemies respawn after you leave? Hope you like backtracking and clearing the same rooms. Then there’s the absence of an objectives screen, which leaves you on your own to figure out your next move. TUS‘s best unspoken advice? Explore everything, sooner or later you’ll find your way. Not very reassuring, is it? Oh, and before I forget— an abrupt, cliffhanger ending after 3+ hours of nonsensical buildup. And yet I can’t recommend The Undead Syndrome enough if you’re even remotely a fan of ‘different’ and the titles I mentioned in the opening. If you’re not, you probably lack a pulse, or at the very least, good taste. That’s not fatal, but it does make you bland. Flaws and all, this is exactly the type of game that should be mentioned whenever XBLIG’s worth is brought up, a spice that can’t be found on arcade or at retail. The mere mention of Killer 7 is enough for me to give this one a go. Setting the trial to download now! Just typing out Killer7 made me want to dig up the game. I’m very partial to games that are a bit different, and I enjoyed some of the ones you mentioned. I definitely have to try this game out. It’s encouraging to see people attempting experiments and diversity. It is different in the way those other titles are. If the type was more prevalent on XBLIG, this would have gone down a lot different, so I forgave (many) things that’d never fly in a retail game. That lack of polish is what makes it an indie, pretty much. I was sold on the game immediately, but the 240 MSP tag will turn off some. It could have been cheaper; for the amount of content, the file size is tiny (20 MB). There’s a few Let’s Plays on YouTube already that’ll give you a better idea of how it runs.